Narda fixed attenuator is 6 dB over the range. 8.2 - 12.4 GHz. 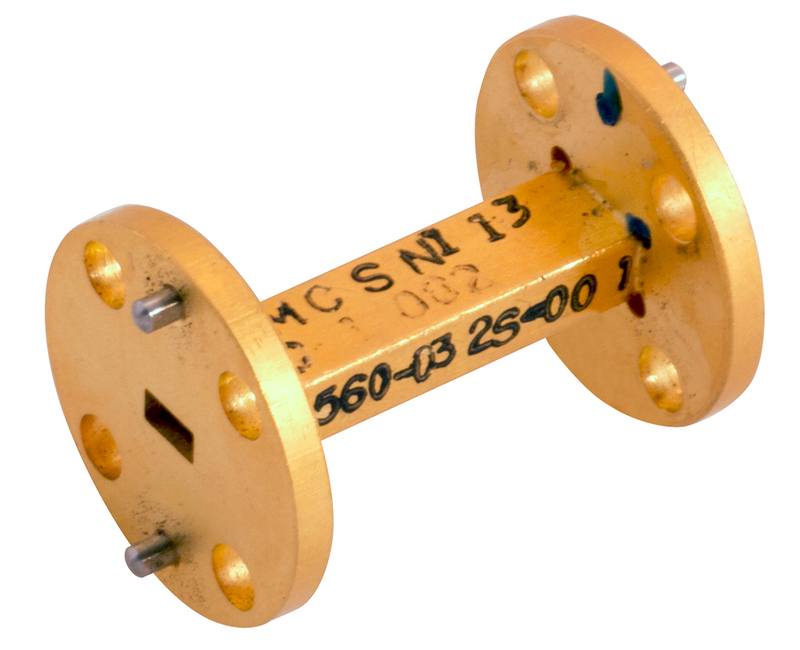 WR-90 flanges. 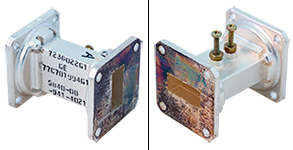 Microwave Associates fixed attenuator is 39 dB @ from 8.2 - 12.4 GHz. 3-3/4" long. 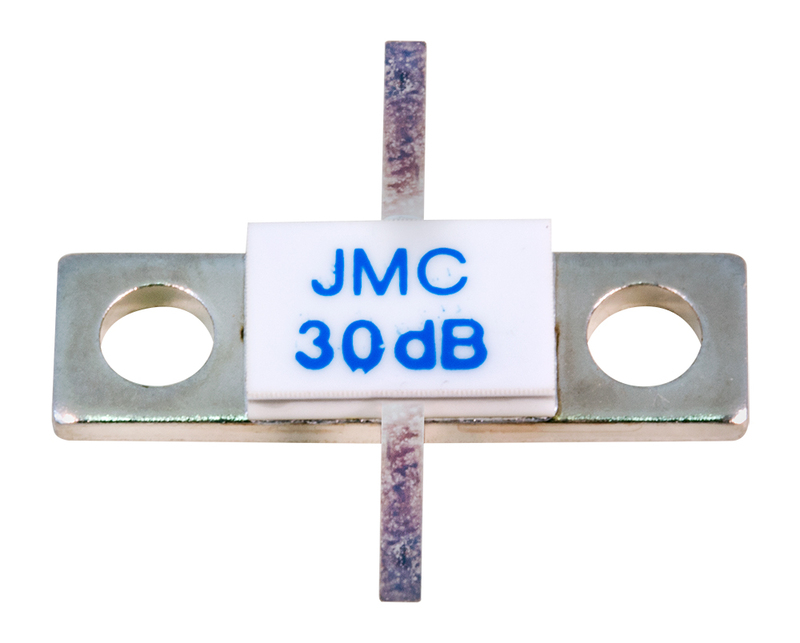 Harris fixed tunable attenuator is 40 dB @ 9.6 GHz. WR-90. 6-1/2" long. Variable attenuator, 0 - 50 dB, with 1N78B mixer diode at output. Decrease attenuation until signal is detected. WR-62. Microwave Development Co. fixed attenuator. Attenuation unknown. 1-5/8" square flange. 3-3/4" long. 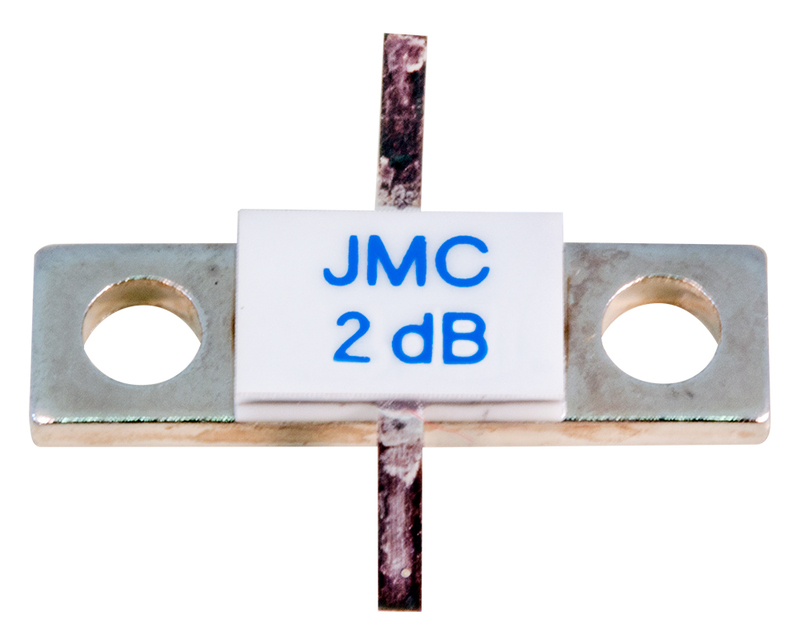 Microwave Development Co. Ka band fixed attenuator. Attenuation unknown. 26.5 - 40 GHz. WR-28 flange. 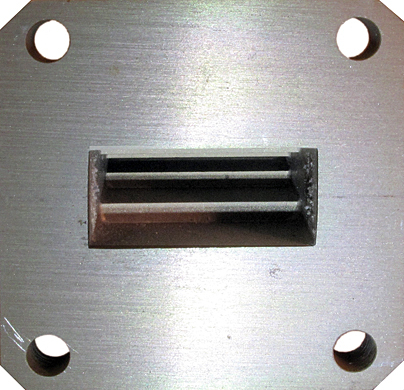 0.75" square flange. 1.5" long. Inside measures 0.28" x 0.14". X-Band waveguide tuning section. WR-90. Silver plated. 1.616" square flanges. 2.06" face to face. 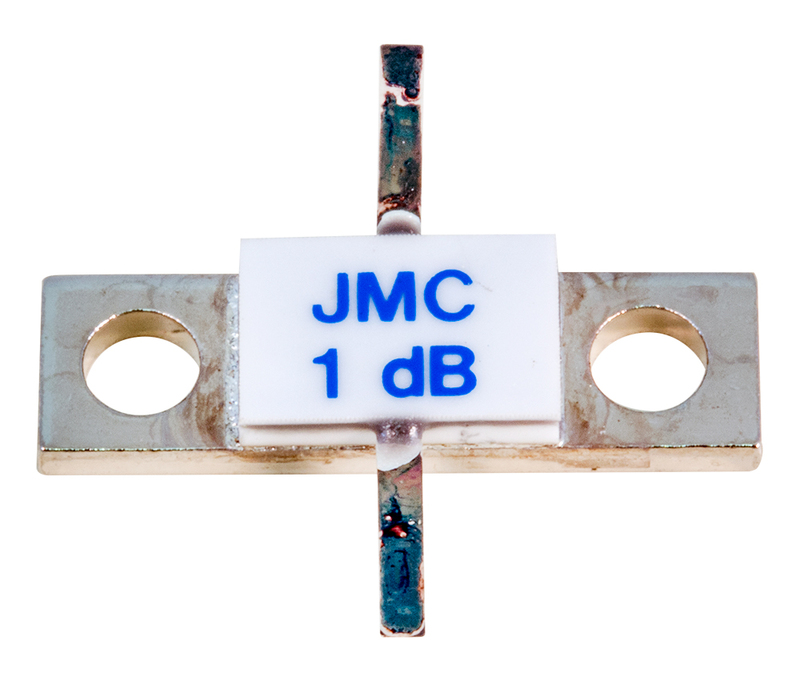 Microwave Development Co. fixed attenuator. 10 - 15 GHz. Db unknown. WR-75 flange. 0.308" x 0.624" opening. 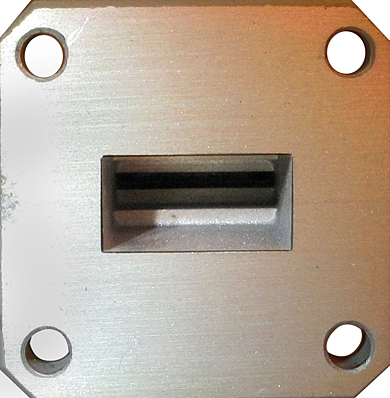 1.314" square flange. 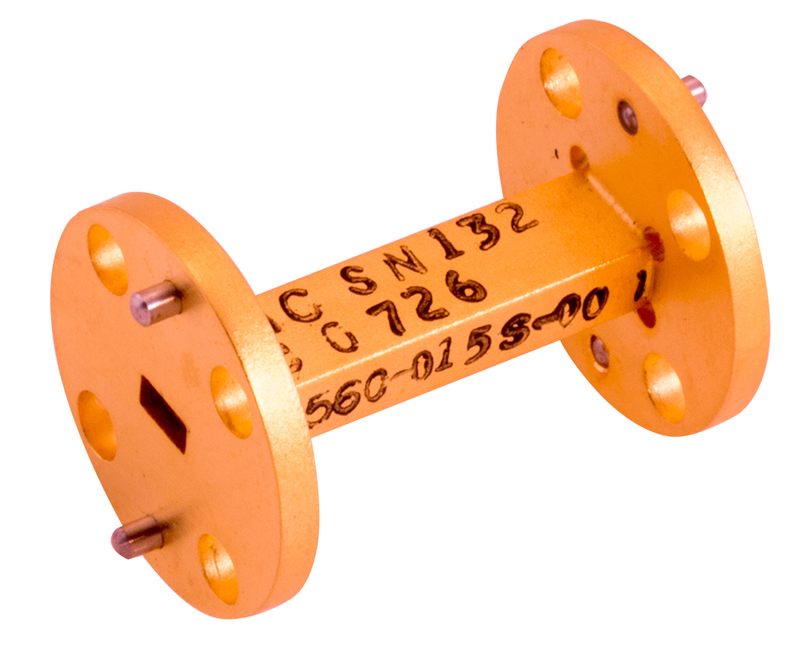 KDI stripline attenuator. 3 dB, 0 - 4 GHz, 20 watts peak, 50 ohms in / out. 0.08" x 0.06" ceramic case. 0.3"L stripline leads. KDI P/N: A3RC50-3. KDI stripline attenuator same as above accept 5 dB. 0.3"L stripline leads. KDI stripline attenuator same as above accept 8 dB. 0.3"L stripline leads. KDI stripline attenuator. 50 ohm, 20 dB, 50 watts. DC-1 GHz. RoHS compliant. KDI attenuator. 1.5 dB ±0.25 dB. 50 ohm in and out. 30 watts peak power. Attenuation: VSWR < 1.15:1, 960 MHz to 1,215 MHz. Collins P/N: 379-0569-050. Additional P/N: A3RC35-5. 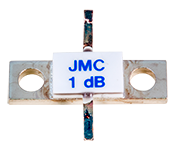 Johanson BeO Flanged Attenuator 1 dB, 100 Watts, DC - 3 GHz, 0.505" L x 0.8" W x 0.135" H. Caution: Substrate contains Beryllium Oxide. Care required when handling. 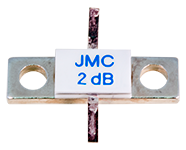 Johanson BeO Flanged Attenuator 2 dB, 100 Watts, DC - 3 GHz, 0.505" L x 0.8" W x 0.135" H. Caution: Substrate contains Beryllium Oxide. Care required when handling. 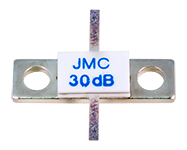 Johanson BeO Flanged Attenuator 30 dB, 100 Watts, DC - 3.5 GHz, VSWR: 1.25:1, 0.505" L x 0.8" W x 0.135" H, RoHS Compliant. Caution: Substrate contains Beryllium Oxide. Care required when handling. 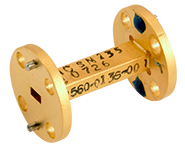 (MWA) 8P560-013S-001 Pic 13 dB 50 - 75 GHz TRG / Alpha Industries attenuator, Millimeter V-band, Gold finish, Flanges: UG385/U through holes, 1" long. (MWA) 8P560-014S-001 Pic 14 dB 50 - 75 GHz TRG / Alpha Industries attenuator, Millimeter V-band, Gold finish, Flanges: UG385/U through holes, 1" long. 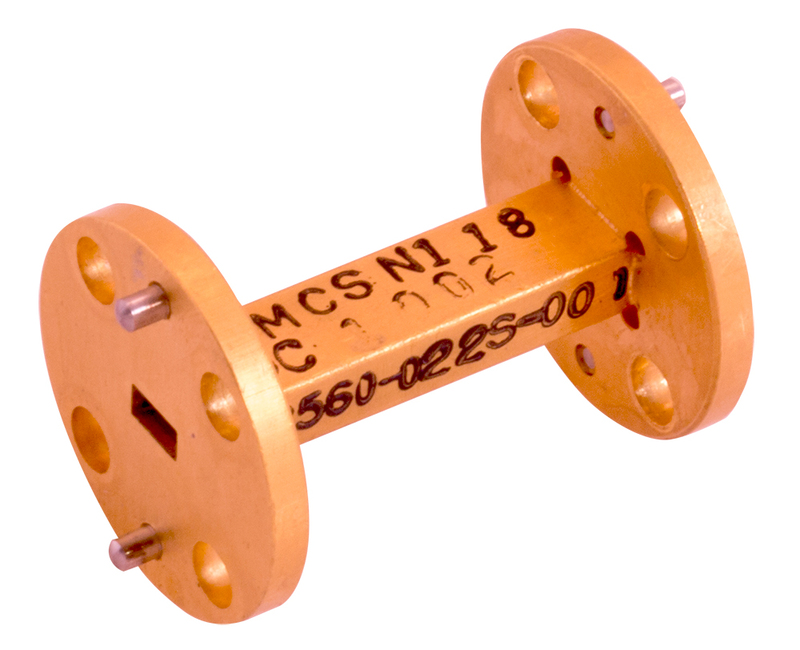 (MWA) 8P560-015S-001 Pic 15 dB 50 - 75 GHz TRG / Alpha Industries attenuator, Millimeter V-band, Gold finish, Flanges: UG385/U through holes, 1" long. 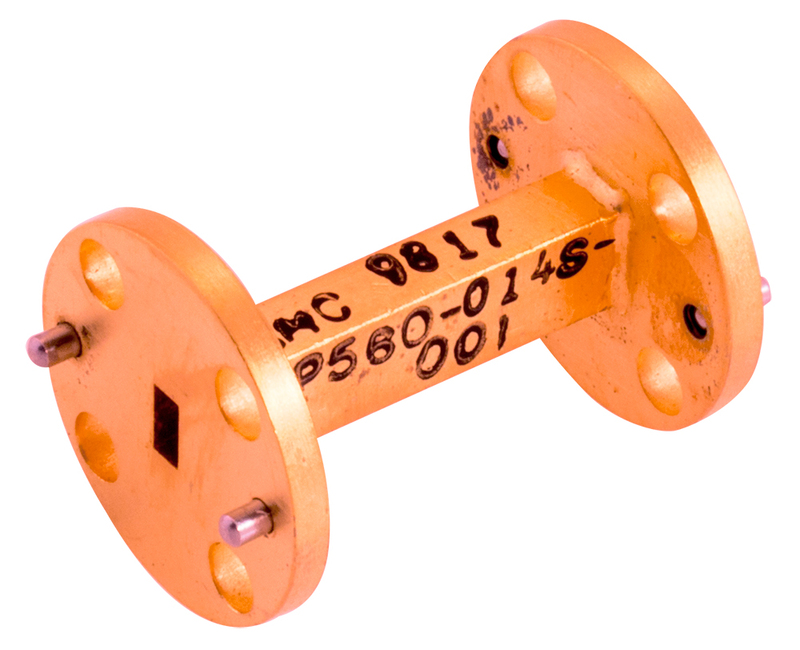 (MWA) 8P560-016S-001 Pic 16 dB 50 - 75 GHz TRG / Alpha Industries attenuator, Millimeter V-band, Gold finish, Flanges: UG385/U through holes, 1" long. 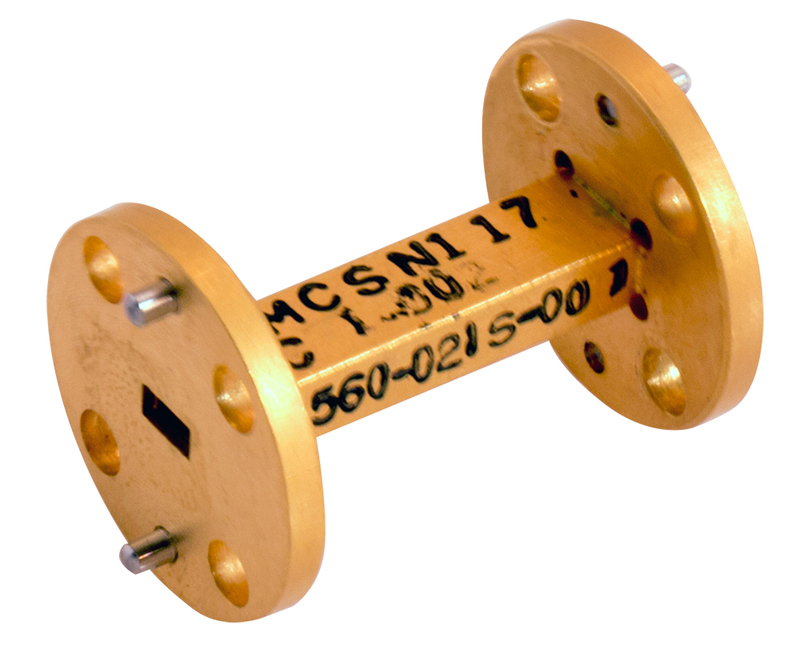 (MWA) 8P560-017S-001 Pic 17 dB 50 - 75 GHz TRG / Alpha Industries attenuator, Millimeter V-band, Gold finish, Flanges: UG385/U through holes, 1" long. 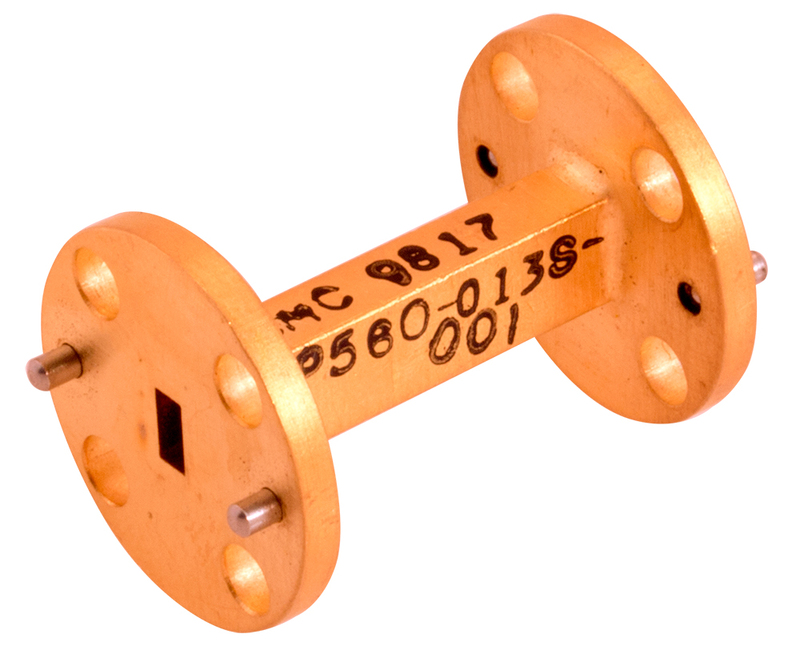 (MWA) 8P560-019S-001 Pic 19 dB 50 - 75 GHz TRG / Alpha Industries attenuator, Millimeter V-band, Gold finish, Flanges: UG385/U through holes, 1" long. (MWA) 8P560-020S-001 Pic 20 dB 50 - 75 GHz TRG / Alpha Industries attenuator, Millimeter V-band, Gold finish, Flanges: UG385/U through holes, 1" long. (MWA) 8P560-021S-001 Pic 21 dB 50 - 75 GHz TRG / Alpha Industries attenuator, Millimeter V-band, Gold finish, Flanges: UG385/U through holes, 1" long. (MWA) 8P560-022S-001 Pic 22 dB 50 - 75 GHz TRG / Alpha Industries attenuator, Millimeter V-band, Gold finish, Flanges: UG385/U through holes, 1" long. 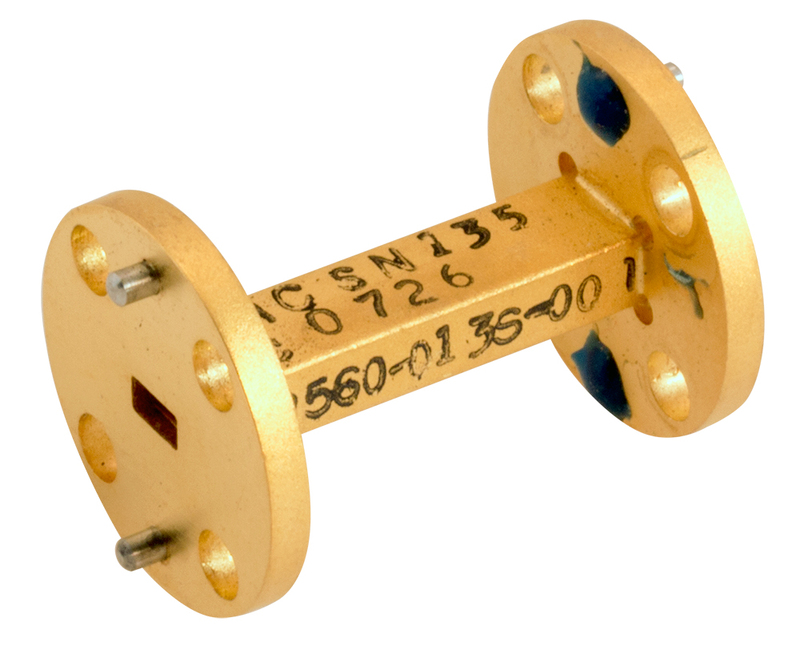 (MWA) 8P560-032S-001 Pic 32 dB 50 - 75 GHz TRG / Alpha Industries attenuator, Millimeter V-band, Gold finish, Flanges: UG385/U through holes, 1" long.